Today, in watercolor class we played some more with the Shizen recycle paper, focusing on the way the color lifts which presents both problem and opportunity. If you keep trying to apply color while the paint is wet, it just slides around and gets muddy, so you need to wait until the paint is dry, and add color in layers. Not glazing, necessarily, though that would work. At any point, even once the paint has dried, it is easy to wet the color and lift much of it. Non-staining colors can be lifted almost to the white of the paper. We each brought in familiar objects to be the subject of our paintings. I took in a novelty mug I have with an elephant’s head as the handle. 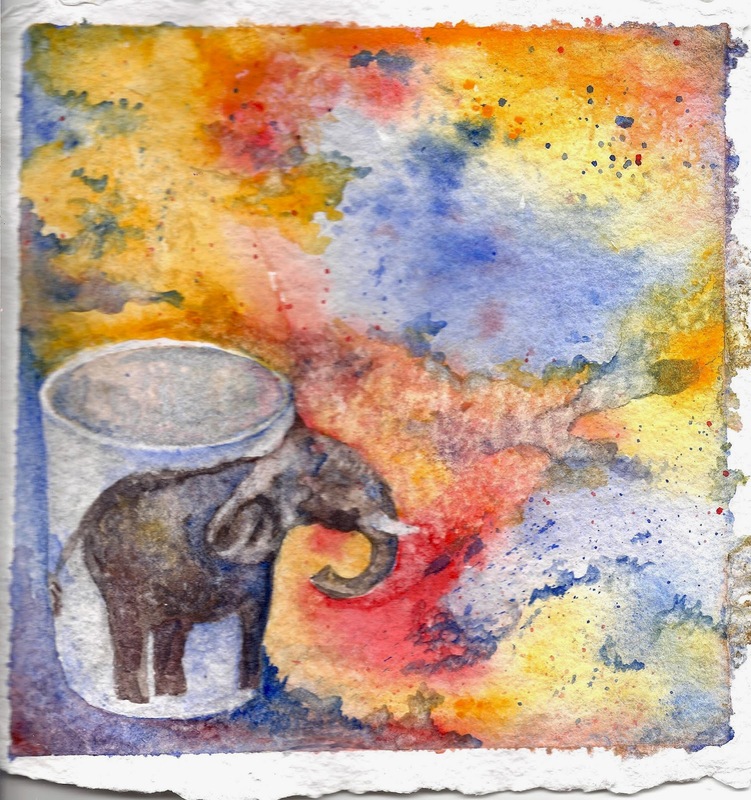 Since I mixed Gamboge, Ultramarine Blue and Pyrrol Red for the elephant’s brown/gray color, I used those three colors in the background. The colors were used wet-in-wet and meant to be non-objective, but of course, I saw a map, and couldn’t help but play with that. Thank you! Ultramarine blue was a good choice for this paper because it's so sedimentary and the paper has so much texture for it to settle into.